Hello everyone and welcome to THE FLOWER CHALLENGE #5. 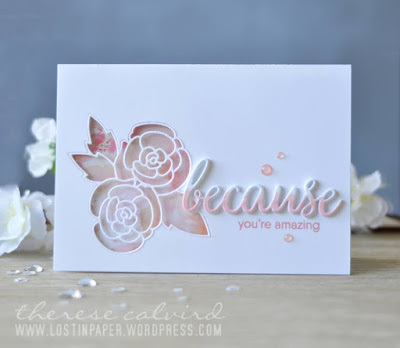 This month, we have the fabulous and talented THERESE from LOST IN PAPER as our Guest Designer and, to make things even more awesome, Therese has a video tutorial on her blog where she will show you how she made the gorgeous card we are CASEing. So, I hope you come along and play with us, we can't wait to see how Therese's card inspired you. Here is a picture of her beautiful card, followed by mine. When I saw Therese's card I was so happy because I had just gotten a couple of dies that totally would work perfectly to create my card. 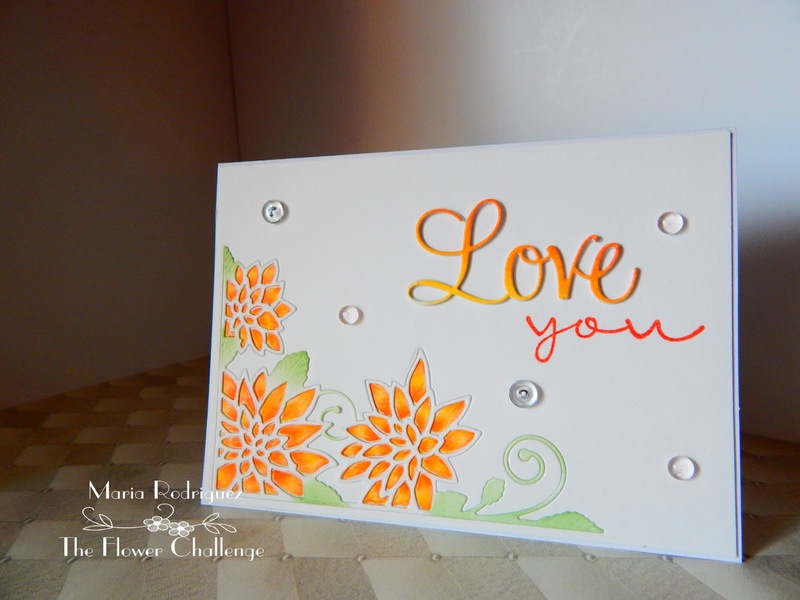 The dies are from Memory Box and this one is called Chrysanthemum Corner, it's so delicate and just beautiful. I die cut a panel of Whisper White card stock and carefully removed the die, then I placed it on top of my card base and lightly traced each petal with pencil, I colored the petals with my Prismacolor pencils and paper stumps dipped in baby oil, then glue the die back in it's negative corner using a two way glue pen, making sure each flower was exactly where it should be. Once the panel was secured, I lightly colored the leaves using a sponge dauber and distress ink. I needed the sentiment to be colored with an Ombre effect so, I grabbed a scrap of white paper and using my Prismacolors I went across the paper from dark to light, trying to blend each color as I start with the next, then using a paper stump, blended the colors even more. The word Love was die cut with a Penny Black die set called Love and Joy. The pretty flower border is stamped with a retired SU set called "Bordering Blooms", the sentiment is from a retired Flourishes set called "Tulips for Friends". 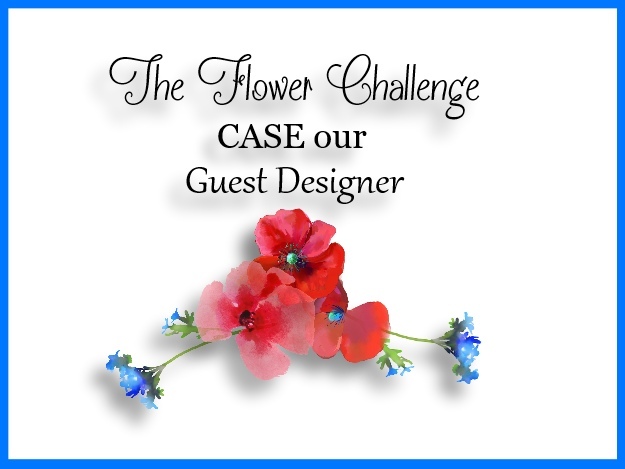 Ok, so now, it's your turn to give this fabulous challenge a try, for more details and inspiration, hop over to THE FLOWER CHALLENGE to check out my teammates awesome cards and then, join us in the gallery, we can't wait to see how Therese's card inspires you. Don't forget to add this banner when you enter the challenge. Hello everyone and welcome to another challenge at SHOPPING OUR STASH, this week we want to see your creations with a Vintage, Shabby Chic, distress look. 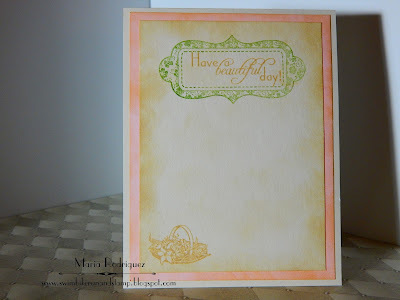 This style is so beautiful so I was so happy to have a few stamps I bought a long time ago and hardly ever used. Here is my card that I hope inspire you to come and play with us. This stamp came in a set I bought on Ebay, all the images on this set are like this, very vintage and feminine, I love them. I think I've used this stamp only once and I think the other ones have never been used so I was so happy that the SHOPPING OUR STASH Challenge this week asked for this style of card making so I went and Shopped MY Stash to create this card. 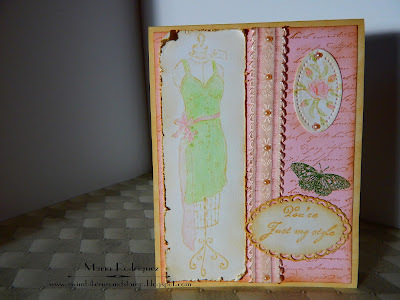 I stamped the dress image onto Strathmore mixed media paper with Antique Linen distress ink, I wanted the lines to be soft and looking old, then I softly colored it with SU markers and an aqua painter and then, ran a distress little tool around the edges. 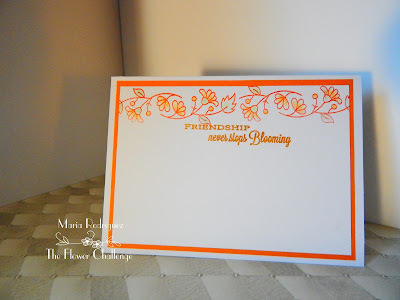 The background was also stamped with distress ink, the little cameo on the right is from an old Flourishes background stamp, I did a bit of masking to surround the rose with some buds and added some peach colored pearls to give the panel some vintage feel. The butterfly and ribbon are from my stash, the sentiment from the set. The sentiment and the basket of flowers are from an old Flourishes set called "Around the Harbor". I sponged Baked Brown Sugar around the panels to make them look old. I hope you got inspired to get into your Vintage, Shabby Chic mode, go Shop YOUR Stash and join my teammates and me in the gallery. Hello dear friends: Well, the LOVE month is in sight so we, at the RETRO RUBBER CHALLENGE want to give you a chance to get a bit of a head start on those Valentines so, for our next challenge we want to see HEARTS😍, big ones, little ones, lots of them. So here is a card I made that hopefully, will inspire you to join my teammates and me in the gallery. 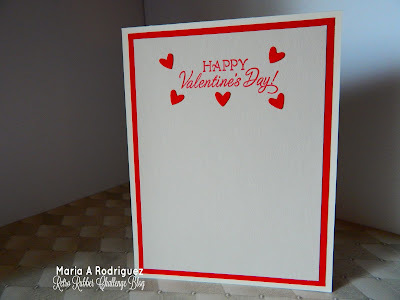 This image is from a long ago retired Flourishes set called, "With Love", it was released back in 2010 or 2011, I love the swirls on this heart, the banner is part of this set, which comes in handy to add a sweet sentiment. I stamped the image with Versafine black ink and clear heat embossed it then colored it with SU markers and an aqua painter. The Pattern paper is from a discontinued line from Lili of the Valley and that little envelope from a punch that, unfortunately, broke some time ago, but I was able to punch a good amount of envelopes with it before I had to dispose if it, sigh! !😕😞 The "love" sentiment it's from a combination of sets and the little heart was punched with the Owl Builder punch from SU. 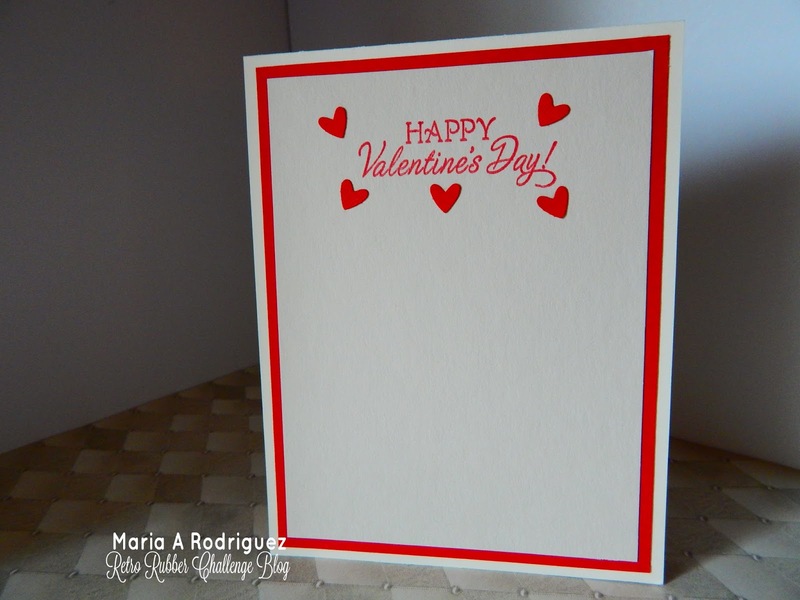 The sentiment is from a Flourishes set called "Sweet Love", I use this set a lot, I realized that I only have a few sets for Valentine's Day so I kind of use this sentiments often. The little hearts are punched with the Owl Builder punch from SU. I hope you have some time this week to come and play along with us at RETRO RUBBER , for more inspiration, please hop over to the challenge and see my teammates beautiful cards. Make sure your stamps are at least ONE YEAR OLD, either from the day of their release or how long you've had them. You can enter no more than 10 other challenges including ours. Post your NEW card onto your blog or on line gallery, no back linking.